This page was a project. Most of you, if you requested to be drawn “at the wedding” are in this picture. A few people were in previous pages. Thanks again to everyone who helped me pull that off! So, I’m sure it is obvious this story is almost over. What’s next? Well, I’ve got plans. I will be focusing on the next Dark Horse miniseries “The American Choppers” next, which will be print-only. But I have two things to keep you busy for at least the next 22 or so weeks after this story ends, and possibly I take a short break between “seasons”. First, I have drawn Ask Axe Cop #100, but I have only posted up to #86, so I have 14 of those to post. I will post one per week after this story ends. Also, Tom Martin and his niece Charlotte proved themselves to be a great team on guest episodes, so we have decided to team up and let them do a full-length guest story. If you need a refresher, here is one of the comics they did for us. More on this project later! And, as I have said, new episodes on FOX start Nov. 2! Malachai and I are currently writing the new story and it’s awesome! I’m excited to draw the insane stuff he’s coming up with. We have created so much together I often forger how fun it is until I do it again. Thanks for reading Axe Cop and making it possible for me to have such a cool job. I can’t believe we have finally reached the wedding day in the comic. I completely forgot to post today because I had some meetings and was not home all day. Here is your page, better late than never. I brought my new Windows Surface with me today, and every time I ended up sitting and waiting, I worked, and I managed to get 3/4 of the final page of this story completed! I am in love with my Surface with Manga Studio installed. It is the portable drawing tablet I always dreamed of. The 5th episode of Axe Cop aired on Saturday. Originally I wrote the first draft of the outline for this one. A good amount changed, but this is a great episode. It definitely brings out the darker, weirder side of Axe Cop which is creepy and hilarious. There were a couple little details in this episode I was not crazy about, but in general I loved it. I like this episode especially because it is not a story taken directly from the comics. It just takes elements and makes a new episode, and that is fun to see come together. I like the take on Bad Santa too. Cobras on his sleigh, I am proud to say, was my idea. We called Malachai to ask him what Bad Santa’s plan is and Malachai said without skipping a beat “to kill God and become Jesus.” He said it like it was so obvious we shouldn’t even have had to ask. Also, the ending is from an unused answer to an Ask Axe Cop question. 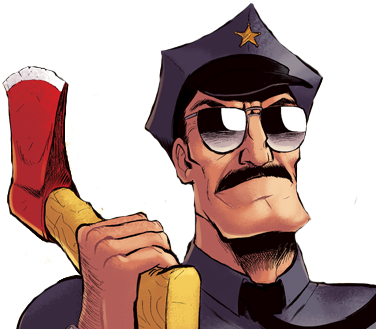 Someone asked what the best day, and worst day of Axe Cop’s life was. Malachai said the day his parents died. He was sad they died, but happy he didn’t have to eat candy canes any more. Then he said he was just medium, but it was the happiest he has ever been… in my notes was the line “medium is the happiest I’ll ever be.” I never made it into a comic, but it worked so well in this episode I’m glad we got to use it. It was such a dark, weird answer. It fit here nicely. Oh yeah, and some of you guessed it last week, I did the voice of the Chubby doll in the babysitting episode. In the Bad Santa episode, I was the voice of the upset merman. Next Saturday is the last episode of the first set of 6! It’s the summer finale. I’m excited to see this episode, starring the rabbit who walks and eats coconuts. Don’t worry, another 6 are already being produced, but as of now I have no clue when they will air. Oh yeah! And the first appearances of some of my Axe Cop Wedding contributors are appearing here. Above we have Adam Juda (aka Dr. Googleman) and Garth Matthams on the left. Also, Thor the Bassett Hound. I decided to use some of Malachai’s mispronunciations of bridal party terms, like “Bride’s Mates” and “Ring Berrier”. Hopefully it is funny and not simply confusing. 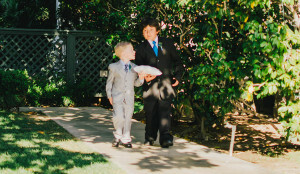 Malachai is a seasoned Ring Berrier, he bore the ring at our brothers Noah’s and Isaiah’s weddings, and then he was ring berrier coach to my step son, Ezra at my wedding. And yes, Tom Nicolle is our dad. The 72 year old father of kids ranging from me to Malachai. If you have ever met my Dad he loves to talk about spiritual things, and so he will be officiating at Axe Cop’s wedding. Well I am trying to get a lot done today, because tonight I am going to see Riff Trax Live: Starship Troopers! Should be fun.